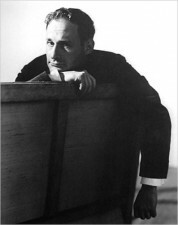 I worked at The New Yorker with Richard Avedon, but never (at Vogue) with the other great fashion photographer of that generation, Irving Penn (pictured), who died today at the age of 92. I admired Penn’s work greatly, though what the New York Times obit calls “the immaculate descriptive quality of his still-life arrangements” always put me off a bit. But that’s about me (I prefer perfection with a hint of tarnish), not Penn.